Hello! We are Matt and Jo Fox. Back in the year 2000 we decided to combine our love for space with our skills in teaching and theatre to create a new and exciting business. We wanted to make a fun, interactive, exciting and educational experience that would and inspire children about space. This was the beginning of Spacefund and the Kids in space show! Since those humble beginnings, Spacefund has grown in size with new shows and new presenters visiting hundreds of schools, science festivals and events throughout the UK. We have even performed in Kenya! We make learning about space, science and engineering a fun and inspiring experience for primary school children, teachers and families. We love space, science, technology, engineering the arts & maths and want you to too! We bring SPACE to you! Spacefund is the UK’s leading space show company. Established in 2000 over 100,000 pupils, teachers and families have experienced our inspiring, fun and educational space shows. We set high standards and are proud of our impressive 4.7 of of 5 overall satisfaction rating from teachers that have seen our shows. Many of our satisfied customers book us year after year. Spacefund has two main aims: to inspire and to excite children with space. Our shows produce a fun, exciting and immersive environment where children learn through use of the imagination, play and sense of discovery. We find this way of ‘informal learning’ is a very powerful and natural way of learning for children. Both “Kids in Space” and “The Biggest Rocket Ever Built!” have been written to inspire and educate and have many links with the National Curriculum. The shows are supported by some excellent further learning materials which can be download here. We also collect ideas from teachers across the country. We have a passion for space, science and engineering and have been performing our shows since the year 2000. To date, over 100,000 children have seen our shows. We have backgrounds in education, theatre, science, astronomy and engineering – the combination of which created the unique Spacefund! We set high standards to provide a professional service from the moment you first contact us. We are experienced in teaching, lecturing and public speaking. We constantly strive to improve and so we ask teachers to evaluate at every school we visit. If you have any comments or ideas then please share them with us. A fun hour long interactive performance that takes children on an imaginary journeythrough our solar system. Highlights include: a recreation of Neil Armstrong’s first step, a bombardment by asteroids and built to scale model planets that show how small the Earth is compared to its giant neighbours! Linked to the National Curriculum Key Stages 1 & 2. Be prepared to time travel back to the 1960′s where calculations were made with slide rules and a computer filled an entire room…your pupils will help us build the mighty Saturn V rocket piece by piece before training as astronauts and attempting to land on the Moon! Help British ESA Astronaut Tim Peake pass his training and blast off into space! 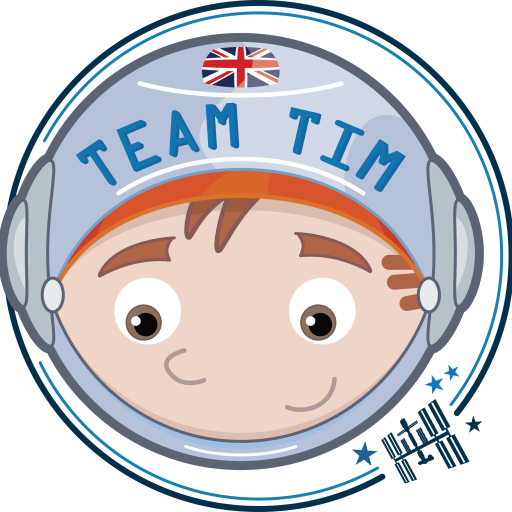 Full of fun, learning and visual effects, Team Tim is an unforgettable interactive experience for Primary school and family audiences that will delight and inspire the next generation.